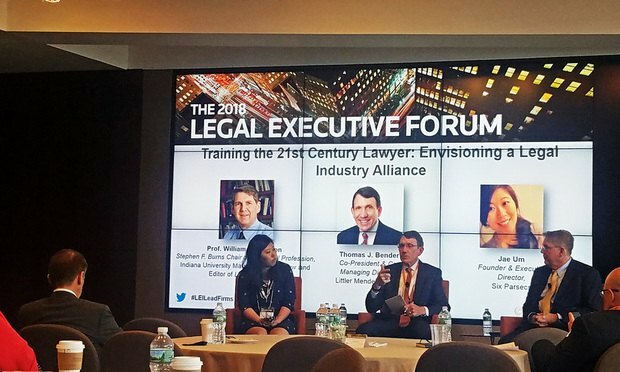 Speakers at the Thomson Reuters 2018 Legal Executive Forum in New York argue that legal education has fallen behind as the legal industry has shifted to serve more operational and business needs. (from left to right): Jae Um, Founder & Executive Director of legal market insights firm Six Parsecs, Thomas Bender, co-president & co-managing director at Littler Mendelson and William Henderson, professor of Law at Indiana University Maurer School of Law speaking at the “Training the 21st Century Lawyer: Envisioning a Legal Industry Alliance” session of Thomson Reuters’ 2018 Legal Executive Forum in New York. Working in today’s legal market requires more skill than just knowing the law, but not all law schools have matched their curriculum to this changing marketplace. Prosecutors said Ho Ka Terence Yung used the internet to terrorize a Georgetown alumni interviewer who did not recommend him for admission. Yung received a full scholarship to the University of Texas School of Law and was interning at the Office of the Texas Attorney General as he was cyberstalking his victim, prosecutors said.